New to photography? Here are three things everyone should understand as they're getting started. Just bought a camera for the first time? Congratulations! You’re probably keen on getting started, and interested to learn as much as you can so you can take great pictures. 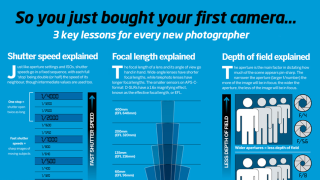 There’s no shortage of information out there on how to use your camera, but to save you feeling overwhelmed we’ve pulled together the three essential things to learn and popped them into a handy cheat sheet. Whether you save it, Pin it, or print it out and stick it to your fridge door, make sure you can access it easily so that you’re never lost! The first thing to get acquainted with is shutter speed. This is the figure on your LCD screen and/or in the viewfinder that lets you know how long the shutter will be open while the image is being taken. This is important, as you need to use the right shutter speed to make sure fast-moving subjects are rendered sharply, or to have a nice pleasing blur to them when you use a tripod. The next thing to get your head around is focal length. Shorter focal lengths correspond with wide angles, so they’re great for landscapes, interiors and anything else where you need to get a lot of the scene into the frame. Longer focal lengths, meanwhile, are typically used to home in on more distant subjects, perhaps to isolate them from their backgrounds. These kinds of lenses are essential for the likes of wildlife and sports photographers, or anyone else that needs to keep their distance from a subject. Depth of field completes the triplet, and the main way in which photographers control this is by adjusting the aperture. Some images suit a narrow depth of field so you can pick out a subject and emphasise its importance over everything else. Others require all the details throughout the frame to be equally focused. Knowing how to switch between the two will elevate your photography to the next level.